The simple single control makes them very easy to operate and combustion performance is excellent from as low as 1.5kW. The cast-iron doors for the Inspire series are available with a traditional black painted surface, but you can add extra style to your stove by choosing one of Heta’s nine modern enamel colours. Front door can be enamelled. Color options here. Inspire 45H is a wide landscape model with the same generous view of the flames. The combustion chamber can take logs up to 42cm and has an efficiency of 84%. It shares the same precise air control as the Inspire 40 throughout its 2.5 – 6.5kW output range. As an option, Inspire stoves can be mounted on a 32cm log store giving the stove a more prominent presence in the room. This convenient addition not only provides the option to store logs, but also enables the operation and re-fueling of the stove from a more com­fortable level. 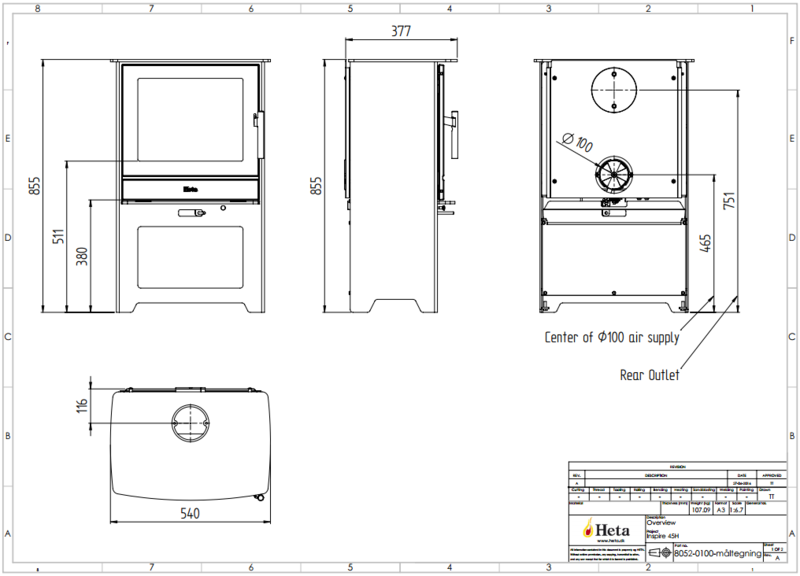 Inspire models can be installed with either a top or rear flue outlet. The inlet provided can also be used to supply direct outside air for combustion. The stoves are covered by a five year warranty.